Approximates the ideal white of natural daylight, shades matched with a light color in the 5000K range will appear ideal in most lighting conditions. 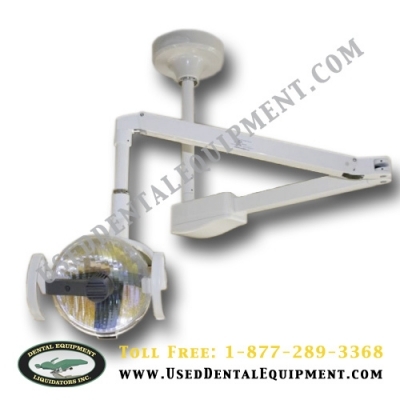 Cool, white light illuminates the oral cavity; the Dichroic-coated reflector filters out the infrared rays and dissipates heat. The handles can be positioned up or down for operator convenience and putting on protective covering for asepsis. A movement of the hand beneath the sensor switch turns the light on and off offering protection to the dentist and assistant from the risk of cross-contamination. The three-way intensity switch adjusts for proper oral cavity illumination and a reduction in eye fatigue. Each light equipped with touchless ON/OFF and manual over-ride switches. Light Output for high intensity (2,600 FTC), medium intensity (2,000 FTC) and composite safe mode (740 FTC). NOTE: Please enter your ceiling height when placing order. 1. When measuring Ceiling Mount configuration for standard drywall ceiling, please provide ceiling height measured from floor to ceiling mounting surface. Light is shipped with domed cover to completely conceal mounting bracket. 2. When measuring Ceiling Mount configuration for drop down ceiling, please provide ceiling height measured from floor to wood backbord and mounting bracket concealed in drop-ceiling. Light is shipped with domed cover to completely conceal mounting bracket.